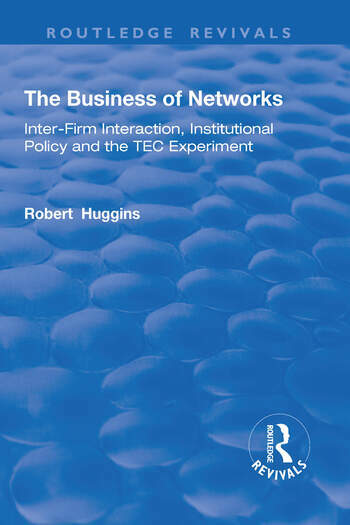 This title was first published in 2000: The first book which brings together and interprets both the theoretical concepts associated with the study of networks in the business world, and the policy applications being applied to the practical building and development of such networks. It maps the changes in the culture of economic development policy that occurred in the UK during the 1990s, incorporating a detailed assessment of the contribution that the Training and Enterprise Councils made to business support policies. The book is published at a time when network and cluster building has risen to the top of economic development agendas not only in UK, but in many countries throughout the world. It offers the most detailed insight so far available into the structure, motivations and processes involved in developing business networks through institutional intervention. The book is relevant to anyone with an interest in business policy and theory. Contents: Introduction; The socio-economics of networks; Space, place and policy intervention; TECs and their network policies - the early years; Business co-operation and TECs - developing networks; The evolution of TECs and networked economic development; Evaluating network policies; The success and failure of implanted networks; Conclusions; References; Index.